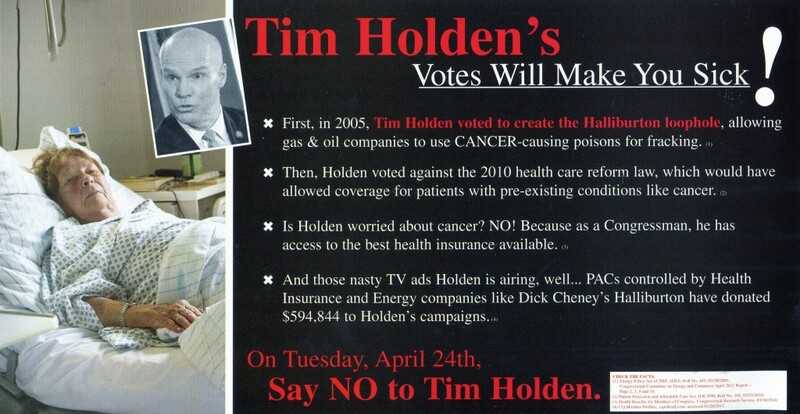 Matt Cartwright’s latest campaign mailing takes a harsh jab at Rep. Tim Holden, saying he isn’t worried about cancer. The piece that links Holden’s votes against Obamacare and for a bill containing the ‘Halliburton loophole’ with the fact that he enjoys the standard health plan for members of Congress. “It’s amazing that Matt Cartwright plays innocent and claims to ‘hate negative ads,’ but is clearly winning the negative ad war – having sent out at least seven negative pieces of mail with blatant, malicious lies about Tim Holden’s character and record,” said Holden Campaign Manager, Eric Nagy. “It is ridiculous to claim, enthusiastically, that Tim Holden is not ‘worried about cancer.’ It’s one of the worst and blatantly false political ads I’ve ever seen,” Nagy added. It’s especially outrageous, his campaign says, because Holden’s signature accomplishment during his two decades in office was his successful effort to obtain $40 million in federal funding to build the Penn State Hershey Cancer Institute. 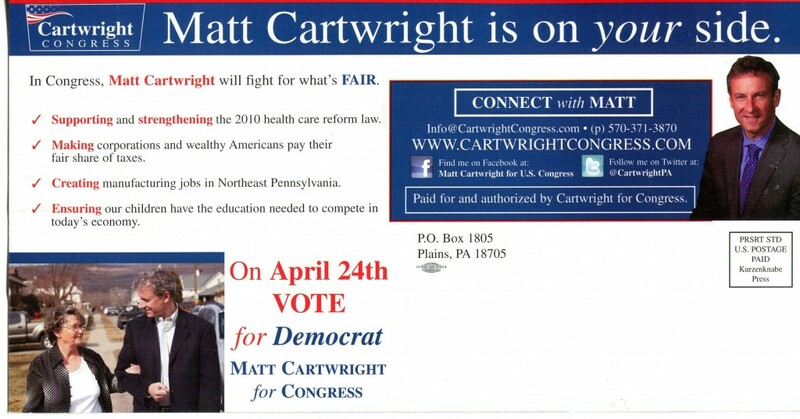 Cartwright’s campaign didn’t back down from the mailer. 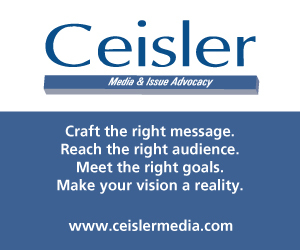 “We stand 100 percent behind the facts in our ads and mailings,” the campaign said in a press release. It referenced a 2011 report by Energy and Commerce Committee Dems that linked hydraulic fracturing – the main subject of the so-called ‘Halliburton loophole’ – to carcinogens. It’s the second time cancer has become an issue in the campaign. Holden’s campaign briefly aired an ad (view it here) criticizing Cartwright’s law firm PAC for contributing to a judge – Michael Toole – who later presided over a case he argued. In a very effective parry, Cartwright’s campaign cast an ad that was meant to be indictment of the legal culture in northeast PA as an attack on the specific client in the case. It was Michele Kachurak, a woman who had been misdiagnosed with cancer and undergone chemotherapy. It worked – Holden pulled the ad and soon thereafter called for a negative ad ceasefire, which Cartwright accepted. 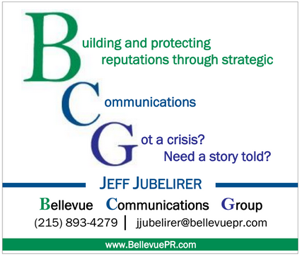 But too late to pull this mailer, according to several direct mail consultants PoliticsPA spoke with. They agreed that Thursday, the day the ceasefire was declared, would likely have been too late to halt the piece. I am not a staffer. I do not agree with every vote that Tim Holden has taken and Matt Cartwright it seems has his heart in the right place. But if we Democrats let one vote among thousands of other votes define a candidate we give American Democracy a bad name. We send our lawmakers to Washington to help us. Holden has voted for the Stimulus Package, Increasing the size of Children’s Health Insurance Program, the Lilly Ledbetter Fair Pay Act, Wall Street Reform, and Saving the Auto Industry, etc. I think if you ask the people that have gone to cancer treatments at the Penn State Cancer Institute if they think that Tim Holden is on the right side of healthcare? They will say yes. My angry Democratic brothers and sisters let us remember that we are all on the same team. That’s the same response I saw on another blog. You’re right! It must be a staffer! I think it’s the one in Easton. Kathleen, you’re a moron. It’s the sleazy, old-style Democratic politicians that have aided corporate America in ruining our country and our “culture”(whatever that means to you). Progressives have never been in charge of the party or the government, so good try….but no one is buying it. Cartwright missed a big one. Holden’s top aid was named in the presentation for Kids for Cash Judge Conahan. It was published in one of the local newspapers. He was listed as former President of Beverage Marketing and presently aide to Holden. A company Conahan used to spread money around. How did everyone miss this story. Holden having an aide who worked for a kids for cash judge should have been a headliner. Looks like all the staffers are back in the office with nothing to do. I believe that Tim Holden embodies representative Democracy. When the Founding Fathers crafted our government they intended that our lawmakers would actually GOVERN. I do not believe that James Madison would agree with Matt Cartwright. His idea about governing boils down to whoever is the best “mud-slinger.” The people of the new PA-17 should vote for Tim Holden. He’s a JFK-LBJ style Democrat, he has fought tooth and nail to strengthen and protect Social Security and Medicare. When Cartwright attacks his record on Healthcare he does not realize that he brought 40 million dollars in Federal funding to build the Penn State Hershey Cancer Institute among thousands of other TANGIBLE things to the district. Matt Cartwright promises that he will vote in a progressive manner and drop partisan bombs. This attitude is REGRESSIVE. Matt Cartwright would be on CNN screaming at Republicans, while Tim Holden will be working across the aisle securing funding for your child’s school, he will bring thousands of infrastructure jobs (highest ranking PA member on Transportation and Infrastructure Committee) and secure additional funding to upgrade your local hospital, so your family and friends will receive the best care. You make the choice. It comes down to a wealthy lawyer who has never held public office. Or a TRUE middle class Democrat that has proven time and time again that he will deliver for your district. With Tim Holden you know that he will DELIVER the benefits our Federal Government has to offer. With Matt Cartwright, you might not even be able to order takeout. The Democrats may not like Holden; however, it is obvious the Progressives who are hellbent on destroying this country and culture love Cartwright. Democrats don’t want Holden in there. That speaks volumes. 1. Quack science. Meanwhile jobs and tax revenues for natural gas are going to other states who are embracing this American energy. 2. Trial lawyers are two-faced, inflammatory pisspots. 4. We are going to vote out a ranking member of congress to send another millionaire demagogue who loves to spread hate-mongering, class warfare? No way. 5. TIM HOLDEN is a hardworking, rollup-the-sleeves Pennsylvanian (born & educated here) who is REALLY MIDDLE CLASS and works hard for Pennsylvanians and Americans. He served our area in law enforcement, and is a ranking member of committees who can bring jobs and projects home to NE Penna. His opponent would be a lost freshman rep who has stated he WON’T WORK with other congressmen. 6. Don’t support sleaze. It is un-American. Voting for the trial attorney only promotes the worst our American democracy offers. Interesting choice of fake names to hide behind, hypppokrit. Didn’t Mr. Cartwright agree to stop negative adds last week? I was surprised to receive this on Saturday, AFTER I saw in the Citizens Voice that Cartwright agreed to stop attack ads. That makes him a big hypocrite in my eyes, and his pants must be ob fire from all that lying he’s doing. My grand daughter, god bless her, has the breast cancer and her doctors down there in Hershey saved her life, at that cancer center they have up there. They even said they were real grateful to Mr. Holden for that grant he got to build the cancer center. I lit a candle at mass yesterday that Mr. Holden wins. Bill, Holden wrote the book on dirty ads like this one. No one is crying for Holden now. I hope he enjoys the taste of his medicine. Shame on Carwright! Twisting unrelated facts together and making inuendo and inaccurate inferences are the games of ineffective people. Stick to the facts! Tell us what you will do and who you are, not what you think the other person may have done or might possibly mean by taking a simple vote.